To make a PowerPoint presentation visually strong you can add shapes and pictures. And of course you can fill your shapes with pictures -- sometimes you end up with not so desirable results. Primarily, you'll find that PowerPoint insists on filling the entire picture to a shape -- in the process, the picture itself may appear distorted. 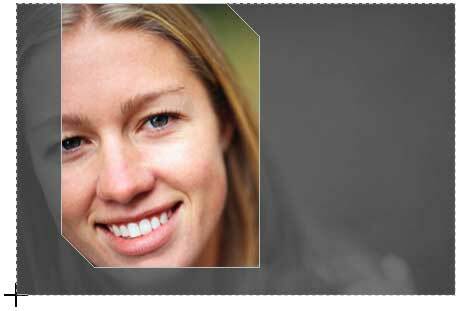 Figure 1 depicts an example -- on the left is the actual picture we used to fill the shape on the right -- note that the woman's face is squeezed and squashed when used as a picture fill. This completely destroys the look we wanted to attain. Fortunately, regaining the lost proportion is an easy option, as you will learn in this tutorial. 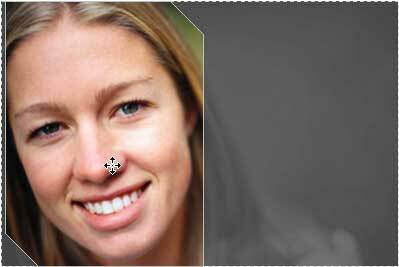 Before you start, we are assuming you have already inserted a shape on your slide that has a picture fill. Select the shape to bring up the Picture Tools Format tab (highlighted in red within Figure 2) of the Ribbon. Activate this contextual tab by clicking it -- locate the Size group, and click the downward pointing arrow in the Crop button (highlighted in blue within Figure 2). This opens the Crop drop-down gallery -- select the Fill option (highlighted in green within Figure 2, above). 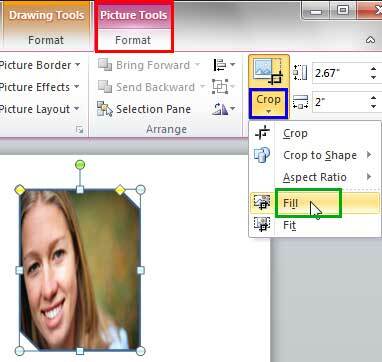 Note: Make sure to select only the Picture Tools Format tab, not the Drawing Tool Format tab. As soon as you select this option, you can see that the picture fill is no more distorted, as shown in Figure 3. Also notice that dark crop handles appear on the edge of the container shape, and blueish-white selection handles appear on the edge of the picture used as fill. Now, you can drag the dark crop handles to resize the container shape. Similarly, you can use the selection handles to resize and reposition the picture fill. However, we suggest that you do not just drag and resize the selection handles yet since there are more options available, and we discuss these options next. Reposition the picture within the shape: Do you want to show a particular portion of the picture fill that may not be visible clearly by default? Look again at Figure 3, above and you will notice that roughly half of the woman's face is visible within the shape -- one of her eyes is in fact not visible at all. To counter this problem, place your cursor anywhere in the middle of the shape away from the edges so that your cursor changes to a four-headed arrow as shown in highlighted in red within Figure 4. Now, click and drag the picture within the shape to reposition it so that the area you want to show is visible within the shape. Note that all crop and selection handles will disappear when you start dragging, as shown in Figure 5. You can also press the Shift key on your keyboard as you are dragging so as to reposition the graphic at 90 degree increments up, down, left, or right. When you achieve the desired result, just click on the slide area away from the shape to come out of the Crop mode. Everything except the selected area is subtracted from the shape fill, as shown in the sample towards the right in Figure 6 (see below). Compare Figures 1 and 6. Resize the picture within the shape: In addition to repositioning the picture, you can also resize the picture fill itself so that you can show a zoomed-in area as the picture fill. To do that, place your cursor on any of the four corner selection handles (blueish-white circles on the four corners of the picture fill). When the cursor is placed on any of the handles the cursor changes to a two sided arrow, as shown highlighted in red within Figure 7. Click to select the handle. Do not let go off your mouse button. Also hold down the Shift key on the keyboard and drag the corner handle to resize the picture fill, as shown in Figure 8. In addition, you can optionally also hold down the Ctrl key (in addition to the Shift key) to resize from the center of the picture. 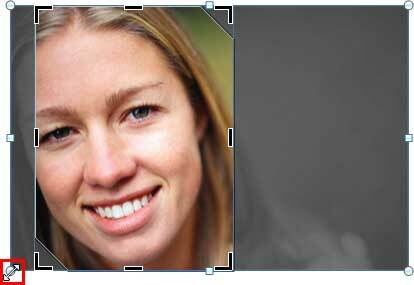 Once you achieve the desired result, just click on the slide area away from the shape to come out of the Crop mode. Once you have resized the picture fill, you can also reposition it as explained in Step 3. 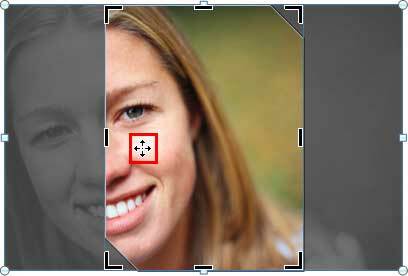 Look at Figure 9, the container shape is filled with just the close-up view of the woman's face. Compare Figures 1, 6, and 9.